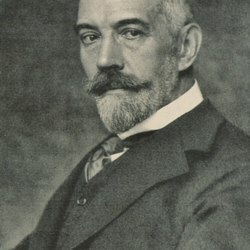 Expects to Confer with German Officials -- Does Not Fear There Will Be War With U.S.
BERLIN, via London, May 21. 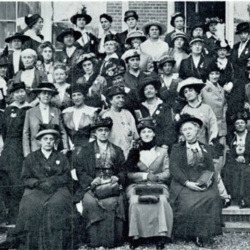 -- Miss Jane Addams has arrived in this city to present to the Foreign Office resolutions adopted at the Women's Peace Conference, held recently at The Hague. She expects to have a conference with Foreign Minister von Jagow before Sunday, and possibly to see Chancellor von Bethmann-Hollwegg as well. She lunched yesterday with United States Ambassador Gerard, who, it is understood, will assist her in an unofficial capacity. Miss Addams will go to Vienna and then to Berne and Paris upon the same mission. She expressed the belief today that there need be no fear of serious eventualities between the United States and Germany. 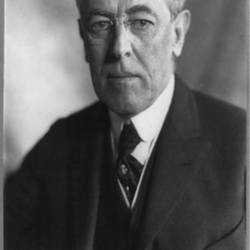 "President Wilson and Secretary Bryan both are firmly opposed to war," she said. 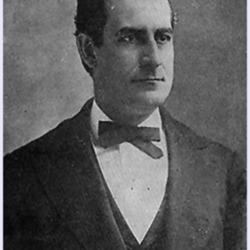 "It seems as though the whole world had gone crazy. 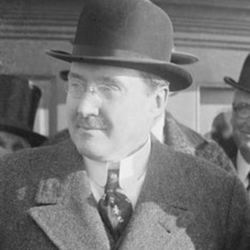 There must be some little spot left where reason will rule." 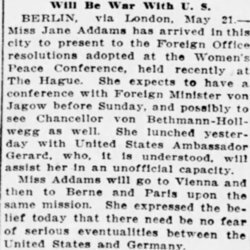 While in Berlin to present peace resolutions, Addams comments that though the world is war-crazy, she expects the United States to remain neutral. 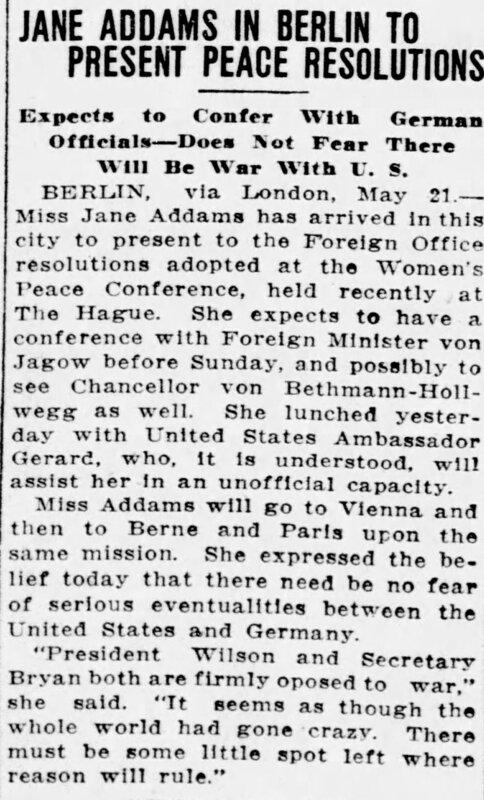 Miss Addams in Berlin with Peace Resolution, The Harrisburg Telegram, May 21, 1915, p. 4. 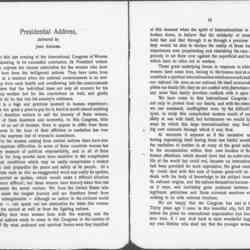 Addams, Jane, “Comments on War with Germany, May 21, 1915 (excerpts),” Jane Addams Digital Edition, accessed April 22, 2019, https://digital.janeaddams.ramapo.edu/items/show/10003.